2019’s high summer collections popping Riviera Print is inspired by palm trees, sun sets, sweet drinks and beaches – our favourite vacation memories printed in bright pink pastel. 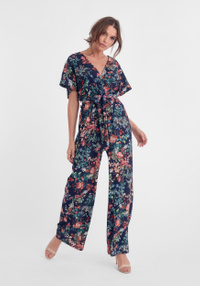 This is Elux Playsuit, a cute summer playsuit with a relaxed fit with a smocking in the waist and on the upper backside. It has adjustable tie straps and elastic bands in waist and above chest which makes the suit stay in place and extra comfortable. The pants are semi long and has two side pockets. This playsuit is the perfect summer piece, works as well to wear on the after beach as on the vacation or to the office on a hot summer day. The print is fresh, young and popping. The suit has no lining and is regular size true to size. Can handle machine wash. See also Fiore Blouse and Madison Dress in the same popping pink print.